This post mostly serves to announce my first yard sale of the year! The weather on Sunday is supposed to be phenomenal – 19 degrees, not too windy and sunny all day – so I figure I might as well take advantage. I have a whole winter’s worth of random stuff to unload, meaning this sale is going to be larger than most. It might be a bit disorganized, but I’ll definitely have lots of boxes for you to rummage through. Also, I should note again that at my yard sales the items are priced to sell. I love stuff, but I get no pleasure from lugging the same things back and forth over and over again. What I enjoy most is seeing my stuff find a new home, and knowing I won’t have to bring it inside ever again. You’ll find me at 5051 Brebeuf near Laurier Park in the Plateau. I expect I’ll be out from around 12-6pm. I also have two bikes with flat tires, and am willing to trade garbage to anyone who can repair them on the spot. It’s been a bit of a slow week for finds. I expect next week will be better because of the great weekend weather. Regardless, I have a few things to show you. One is this collection of meticulously organized newspaper clippings. There’s about two trash bags worth. Most look to be from the late 60s and early 70s, and cover various local, national, and world issues. I imagine the person who collected them was pretty well educated. For instance, “Americanization” is actually divided into two categories: culture and ownership. Most people wouldn’t have bothered with one Americanization category, let alone two! I think there’s actually the potential for a cool project here. If scanned and catalogued they might provide an interesting window into the issues of the times, as well as the perspective of the person who collected them. Unfortunately I have no time to do anything like that, but if something like that interests you let me know! I wouldn’t ask anything for the clippings, provided they go to a good home. I pulled a few items of particular interest from the folders. 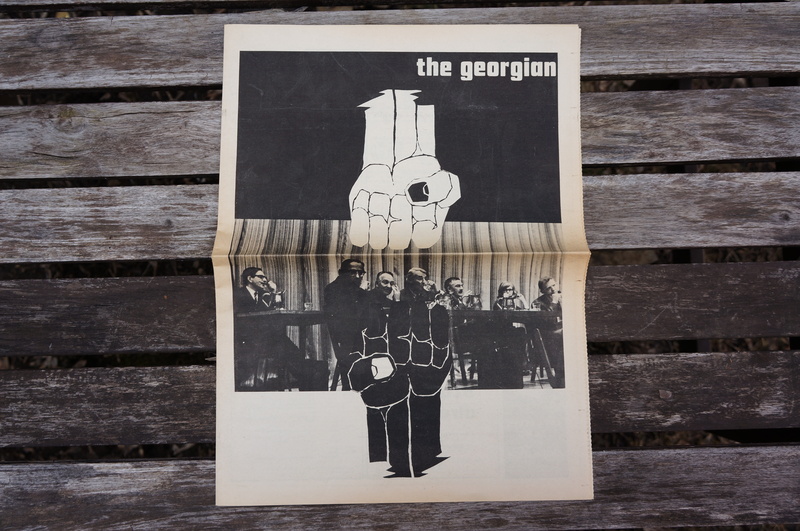 One is this 1969 issue of The Georgian, a student newspaper of the Sir George Williams (now Concordia) University. It was published around the time of the Computer Riots, when 200 students occupied the university’s computer center to protest the administration’s dismissive attitude towards the racism of one of their teachers. A local archivist who focuses on Montreal’s underground culture called this particular issue a “classic,” and will likely want it because it’s in very good condition for its age. Click the link above to read more about the riots, and to see some quality scans of this magazine. On that note, if anyone in Montreal has any old underground stuff they’re looking to get rid of, including show posters, magazines, newspapers, videos, cassettes (including radio recordings that aren’t of classical music), and etc, let me know. I can put you in contact with someone who may be interested in acquiring them. 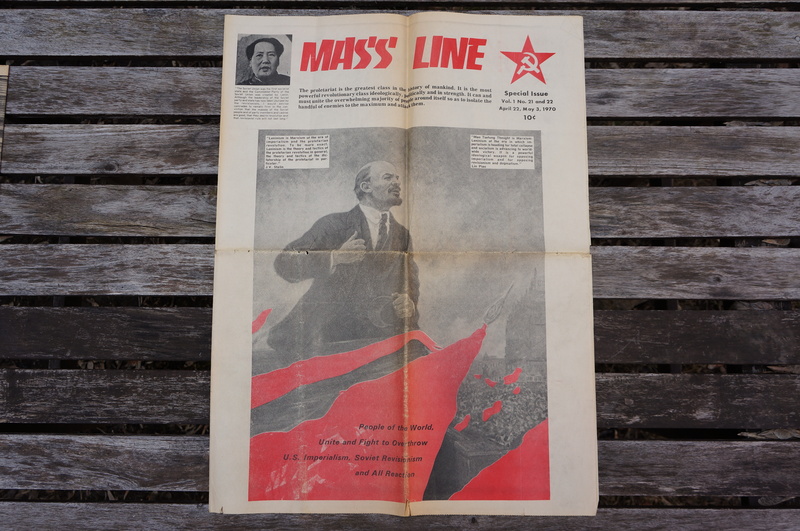 I also found this 1970 “Mass Line” magazine in one of the folders. Mass line refers to a strategy of public consultation employed by Mao Zedong around the time of the Chinese Revolution. 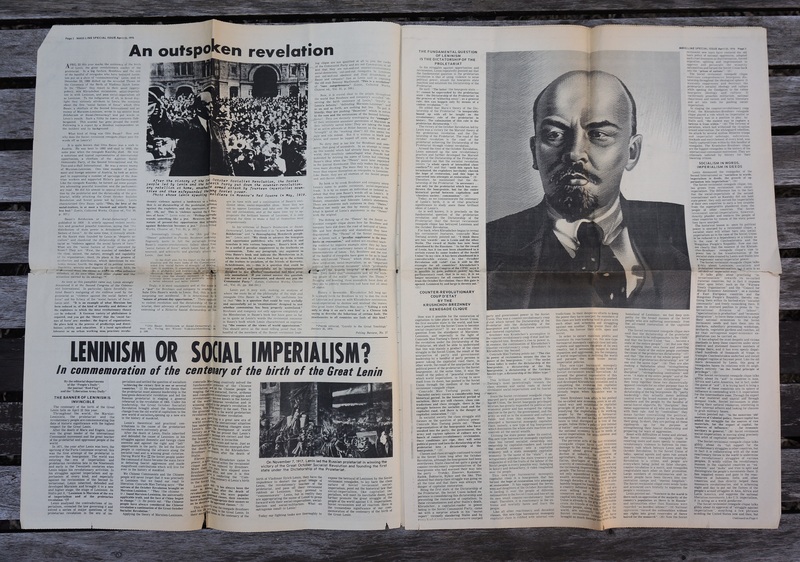 The magazine promotes the ideas of Lenin and Mao while attacking both “U.S. Imperialism” and “Soviet Revisionism.” It’s certainly an interesting item, one I wasn’t able to find any reference to on Google. 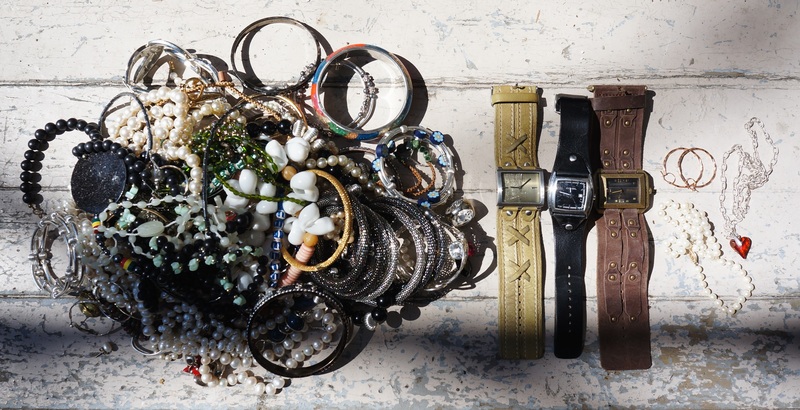 … and a mound of jewelry just a block away from my house. Most of it isn’t particularly special, but I did save a silver necklace, a possibly pearl necklace with a 14k gold clasp, and a pair of 14k gold earrings that are worth about 40$ in scrap. 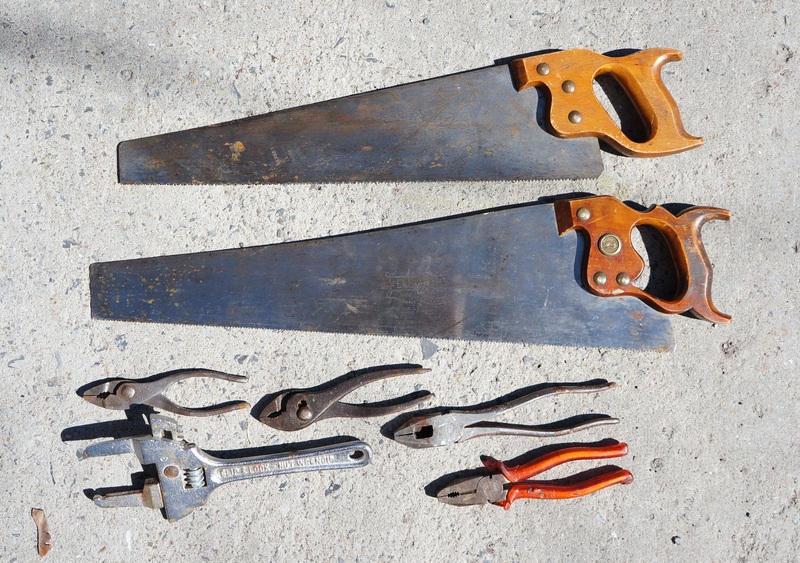 Those saws may be Henry Disstons……..made in Toronto. One is made by an “R.H. Smith” of St Catharine’s Ontario. The other looks to be marked “A.R.Perry & Bros” though it’s very faint (and I couldn’t find anything matching that name on Google). I don’t think either are Disstons, but they’re quite nice regardless and probably made around the turn of the century. 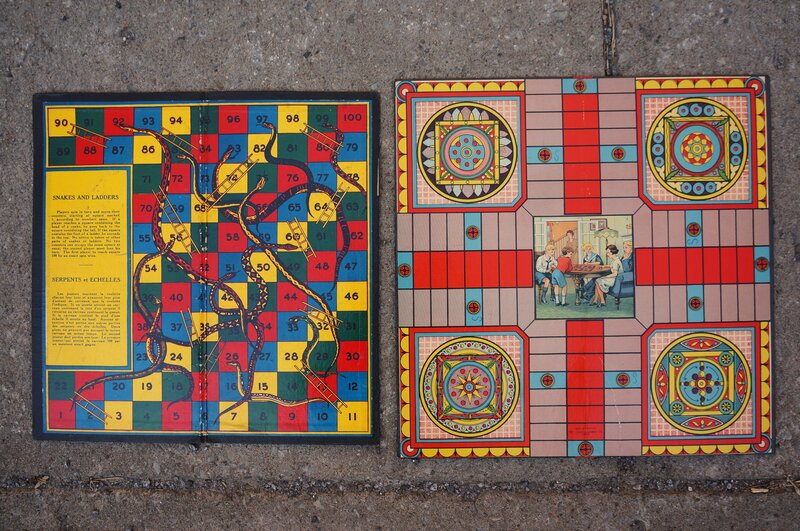 Your parcheesi game board has the best graphics of any I’ve seen. Your grandpa would l-o-v-e those saws. Totally agree with Parcheesi graphics, beautiful. Did you read this great story from The Gazette in Montréal last year? Thanks to a sharp-eyed janitor, some pieces of St-Lambert history have made it out of the Dumpster and into the trophy case. Last week, the janitor found about a dozen old sports trophies in a Dumpster close to the building where he works — and one of them is 130 years old. Speaking on condition of not being named for fear of losing his job, he said that when he was throwing garbage into the Dumpster, he noticed the trophies frozen in the ice inside. Normally, he picks up records or electronic equipment that he donates to the thrift shop, but when he spotted the trophies, he said he was “livid” that someone would discard them in such a way. Eventually, he took about a dozen trophies out, and gave three of them to the local historical society. While the janitor said he didn’t know where the trophies came from, a spokesperson for the South Shore city of St-Lambert confirmed that the trophies were thrown out to free up space during the renovation of the Eric-Sharp Arena, which is located about 15 metres from the Dumpster. She said she never saw these trophies on display before. Malo said the trophy commemorating the canoe race from 1884 is particularly interesting because canoe races, based on aboriginal customs, used to be important events in St-Lambert. The other trophy the janitor donated to the historical society is a silver (or silver-plated) cup from 1924. The Spiller Trophy was presented by the Otterburn Boating Club to the St-Lambert rowing club for winning a race. Even if you don’t consider the trophy’s historical value, Malo said, it is a very beautiful item. “I would put it into my living room (and fill it) with flowers,” she said. The final item the janitor donated is a plaque commemorating an exchange between St-Lambert and the city of Fribourg, Switzerland. The plaque is engraved with a picture of Fribourg. It is not known what year it is from or under what circumstances it was awarded. The janitor said he kept some of the more recent sports items he found. He said he has no intention of selling them, and will give them to the right people eventually. The janitor said he suspects the garbage truck picked up at least a dozen more trophies and carried them to the dump before he could get to them. St-Lambert Mayor Alain Dépatie agreed that the trophies shouldn’t have been thrown away. “They should be stored or given to different organizations that follow the history of St-Lambert,” he said. Nope, first I heard of it. Neat story, and I’m glad the guy was there to save them. There’s a couple here who own a restaurant called The Mud House and they’ve “papered” the entire restroom, inc. the ceilings, using those old board games. It’s amazing. There’s a niche market on those. Keep up the good work. I’m enjoying your trash-to-treasure adventures. 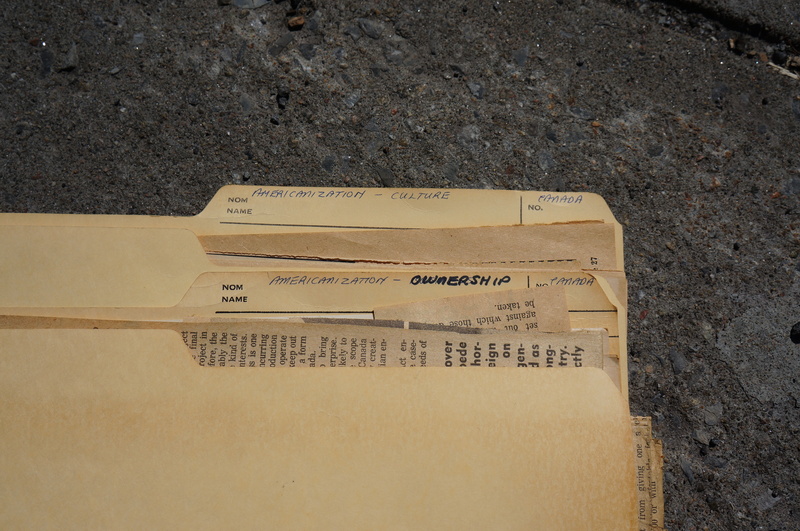 I hate people throwing out historic stuff.Read this great article. Robert Hill, in 1992, looks over his journal prior to attending anniversary of Dieppe raid. When Robert Henry Hill of Lacombe died in 2002, he left behind a chronicle of his experiences as a captured soldier during the Second World War. And now that huge journal, and the piece of history it represents, has been rescued from the City of Red Deer landfill. “It’s basically rescued history that would have been lost forever . . . the names of the individuals in the photos we’ll be able to cross-reference with other photos and identify previously unknown people now,” said Rory Cory, senior curator at the Military Museums in Calgary. In March, Cade Graville, a 28-year-old roofer from Sylvan Lake, was dumping refuse from a job he had just completed in Red Deer at the city’s landfill. A cardboard box marked “R.H. 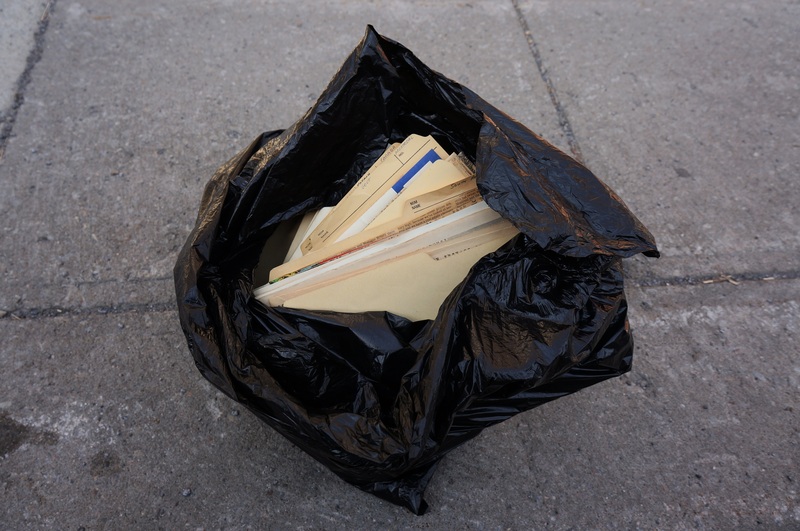 Hill,” its contents spilled out into a dumpster, caught his eye. “I have a keen eye for army green, and when I saw an army badge and I recognized the chevron, I jumped right in (the dumpster),” said Graville, who comes from a military family and served with the Canadian Forces. Graville scooped the war medals, framed pictures and newspaper clippings back into the box, and said he knew when he picked up a thick, leather-bound journal that he had something special in his hands. “I thought about keeping it but it’s just too big of a find not to share, I think I made the right decision,” Graville said. The journal details Hill’s 33-month imprisonment at Stalag VIII-B, a notorious German PoW camp located in Poland during the Second World War, after the disastrous Dieppe raid on Aug. 19, 1942, in Northern France. “Each of these scrapbooks are unique, one-of-a-kind objects of the experiences of a World War II prisoner,” said Cory. Graville took the rescued artifacts to the Military Museums last week, and Hill’s journal is now on display in the main atrium of the King’s Own Calgary Regiment Museum (formerly the Calgary Tanks Regiment, which Hill was enlisted under during the war). Cory said Hill’s journal is one of several in the Military Museums’ possession, but the detailed information (particularly the captioned photos and prison camp money) inside makes Hill’s account an incredibly rare find. The journal was provided by the YMCA to Hill during his internment at Stalag VIII-B. Cory said it was common for Allied PoWs to be allowed care packages (consisting of food, cigarettes, writing materials, even sporting goods) from the Red Cross, YMCA and other Canadian charities while they lived under Nazi imprisonment. A framed, May 1992 Advocate article, found in the dumpster along with his journal, reported on Hill (then 77), getting set to travel to Dieppe to mark the 50th anniversary of the invasion. He recounted his harrowing story of prison camp survival. For nearly three years, the captured tank driver lived on bread, turnips, potatoes, hard cheese and “the odd chunk of horse meat.” Hill credited weekly Red Cross packages of margarine, jam, powdered milk, biscuits, corned beef and chocolate with helping keep him alive. Starting in October 1942, he was one of 1,800 prisoners chained for 12 hours a day and denied their Red Cross packages for the next 13 months. The Germans were retaliating to the news that Nazi PoWs had drowned in the English Channel with their hands bound. The lack of nutrition left him with weak eyesight, and he had to rely on his fellow soldiers to enter information into his log book. “I don’t know why I keep this stuff really,” Hill said in 1992. The book has neatly-written lists of soldiers’ names, what they ate, the parcels and cards they received from home, photos and even a German guard’s arm band — taken from a Nazi’s lifeless body. Hill admitted in the 1992 account that he gave himself a 50 per cent chance of returning home alive from Stalag VIII-B. Of the 4,396 Canadian soldiers involved in the Dieppe raid, 993 were killed, 1,874 were captured, and 586 returned to England wounded. The Allied attempt to test the defences of Adolf Hitler’s continental fortress is considered one of the greatest military disasters in Canadian history. The Allies came under heavy fire from the cliffs above the beach in Northern France. “It was a terrible experience but also a benchmark moment in Canadian history, and to have this album is important to our history,” said Michael Dawe, curator of history at the Red Deer Museum. Dawe is familiar with Hill’s story and said one of his only surviving relatives, a step-son, passed away a few years ago. He can’t imagine someone would knowingly throw out such an important piece of Canadian military history. Neither can the Military Museums curator. “You’d be surprised, this is the second or third instance we’ve had like this since I started here (four years ago),” Cory said. As the years pass since the war’s end and more veterans die, it is important that families take stock of historical artifacts in their possession, so the relics get the treatment they deserve, Cory said. “Hopefully the Second World War generation that is still around is having conversations with their family members now, so they can identify the things that are important to preserve,” Cory said. It’s the first I’ve heard of this as well. Glad you hear someone saved it.